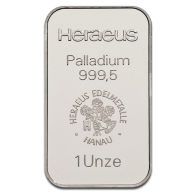 Heraeus is Germany's largest precious metals refining company, and a manufacturer of investment grade bullion products, including gold, silver, platinum and palladium products. Heraeus also wholly own Argor-Heraeus, one of Switzerland's most prominent precious metals refineries. 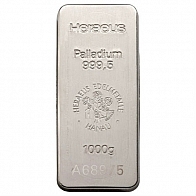 Heraeus palladium bars as available in a range of sizes, including the most popular 100 gram and 1 ounce palladium bars. All Heraeus palladium bars have a minimum fineness of 999.5.